I flew down to LA for Siggraph on Saturday night; fighting a cold all the way down on the plane. Lots of doses of vitamin C and orange juice kept things under control, for at least that short flight. Now it’s Monday afternoon. I’ve done just strategic strikes on the convention so far – mostly opting to stay in the hotel room and nurse myself back to health. Tomorrow the events I’m most interested in really start up, so hopefully I’ll be feeling good enough. The good news is that I seem to have avoided a bad cold; the trade-off (as usual) is that it’ll probably hang around as a low-level cold for much longer as a result. Ah well. Since I’m lying low, I couldn’t resist taking the opportunity to walk a few short blocks to the new Disney Concert Hall here. It’s a newish Frank Gehry building, and I was curious to see how his architecture has evolved since building the Experience Music Project. 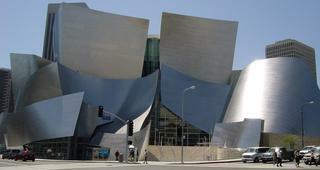 I love Gehry’s designs for artistic spaces. If the art within the building evokes emotions and ideas within the viewer, why shouldn’t the building as well? I love coming to conventions, because there are usually such a variety of people. Well, of course, most of them are geeks like me, but I love hearing the variety of languages and variations on geek from across the globe.